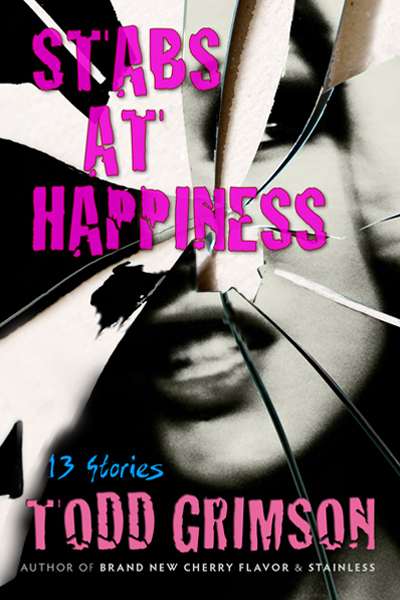 The thirteen stories in STABS AT HAPPINESS by Todd Grimson range in setting from the farthest reaches of the Amazon to the casbahs of Morocco, with stops in the Warholesque downtown New York of 1973, the corrupt last days of pre-Castro Havana 1959, or San Francisco just as Prohibition came to an end in 1932. These sometimes tragic, sometimes darkly comic or surreal stories are populated by desperate vagabonds, prostitutes, explorers, gangsters, transvestites, starlets and others on the run or at the end of the line, in a unique voice reminiscent sometimes of Don DeLillo, Donald Barthelme, Haruki Murakami or Graham Greene - a voice of original talent and depth. "Grimson's stories bear traces of Kafka, and the uncanny narrative syllogisms of Borges and Barthelme. The familiar is rare in STABS AT HAPPINESS...Grimson has created a world awash in the dazed impossibility of things as they are." "A vivid, engaging, commendable, recommendable return to print for an unsung local author." "Grimson anchors all his stories with well-wrought descriptions of people and places that linger long afterward." "The stories in Todd Grimson's brilliant new collection shine a blinding, sinister light onto the darker chambers of the human heart. ... In the tradition of writers like Hubert Selby, Jr., Paul Bowles, and Robert Stone, Grimson remains a true original: a "
"Grimson's short fiction occupies that high, clear zone where Borges and Kafka dwell. The atmosphere is intoxicating and ominous. The view is limitless, seductive, always unexpected and distinctly dangerous. Delicious." "Todd Grimson's unique stories carry me into fascinating situations, where in the corners of rooms quick, strange, and wary minds entangle. His angst-ridden characters are aliens at home, encountering the non-negotiable. "Nothing in Tangier" is an excrucia"
"At his best, Todd Grimson channels the likes of Paul Bowles and Graham Greene. He works effortlessly, with fine result." "Todd Grimson's stories are perhaps slightly less ruthless than his splendid meta-pulp novels, but they are ruthless enough... our teeth settle on a tough, convincing bone of reality... to become literature. Even in the exquisitely and more conventionally "